It’s often said that a picture is worth a thousand words. 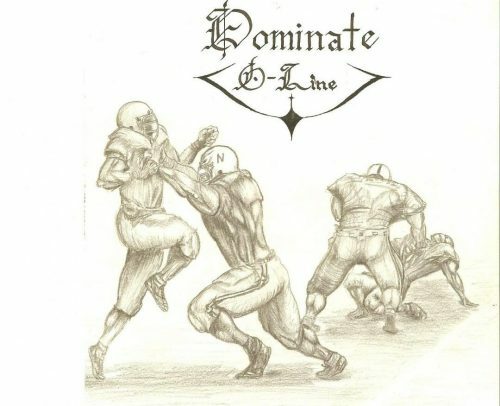 Take a quick look at the pencil drawing you see here, compliments of former Husker offensive lineman Mike VanCleave. Question: You always were a pretty hard weight lifter, weren’t you Brenden? Brenden Stai: Oh yeah, I took a lot of pride in that, for sure. I came from a great high school program, Esperanza, there in Yorba Linda, California, Orange County. Esperanza High School is well known for its weightlifting program. Q: Was that a major draw that took you to Nebraska? BS: I think so, yeah. The Esperanza Aztecs, they built their whole football program around strength and conditioning. And the guy that ran it out there, he later became the head coach. He’s an amazing guy who grew up in the same kind of mindset, who grew up with strength conditioning and flexibility and everything. He was a big weightlifter guy, and I remember his kid who we used to mess around with. He’s no longer a kid. He recently graduated from West Point. He had that kid doing the clean and jerk when he was 5 yrs. old, so you can never start too young. BS: Exactly. You know, George Darlington was the one who recruited me. He just happened to be in the weight room at Esperanza and was looking at another guy who was one of the top rated defensive tackles in the nation, Keith Vitti, who was my workout buddy. And when George came in to take a look he asked my coach, “Well, who in the heck is this kid next to him?” And my coach said, ”As a matter of fact, a lot of schools on the west coast are looking at him. You might want to take some time and look at his film and see what you think.” And before you knew it, I was getting letters from Nebraska and asking me to take a visit. At the time I was pretty much everything but signed to Arizona State. Their offensive line coach there, I absolutely loved. He was always around, he was always making an effort to really win me over, and he did. And it wasn’t that hard because a lot of my heart was in that area, my mom’s family was from Phoenix. And looking back at that now, thank God I didn’t go, because a few things happened a year after I went to Nebraska, and the whole coaching staff was fired. So it was great I stayed away from there. Now, Tom Osborne, he ended up coming out. It was a cool day, sitting out in one of these -out in California the population has really affected some of the facilities, so they have these what they call ‘portables,’ like a mobile home, they use as a classroom, and you see them everywhere- well, I was out in one of these portables and Coach comes knocking on the door, peeks his head in and says, “Hey, I need Brenden to step outside for a minute.” And the teacher was like, “That’s okay.” So I walk outside and here’s Coach Osborne standing there in his red blazer and gray slacks, looking at me kinda with that one eye half-open, the other eye with that squint, you know? And he has his hands crossed and he’s just himself. And of course, I knew who he was -I really didn’t kind of take in the whole moment- here was this legend who took the time to come to my high school and sit down and watch film with me and ask me to take a visit to Nebraska officially. And I was like, ‘Yeah, I’m in.’ And I ended up taking a visit out to Nebraska and I ended up recommitting myself. Q: Can you describe your first fall camp? What stood out to you? BS: Well, I made the trip across country with my mom and my girlfriend, who’s now my wife. I was obviously in love with my girlfriend and there was a lot going on. I remember the day they dropped me off, I stayed a couple days at Coach Darlington’s house. He lived out south of town out on Yankee Hill on a big, nice, old acreage. And when they left, I remember feeling this overwhelming feeling of being abandoned. All of a sudden I didn’t know if I was in the wrong place, not knowing anybody, ‘Did I make the wrong decision?’ And it didn’t take long once I transferred from George’s house to down at the University to get ready for fall camp. I think it was about two weeks before the varsity squad, and obviously, at this time they had the freshman football squad. I think I stayed in Schramm dorm for camp and ended up transferring to Abel Hall. You had that feeling of being abandoned and being lonely and missing everything, literally. 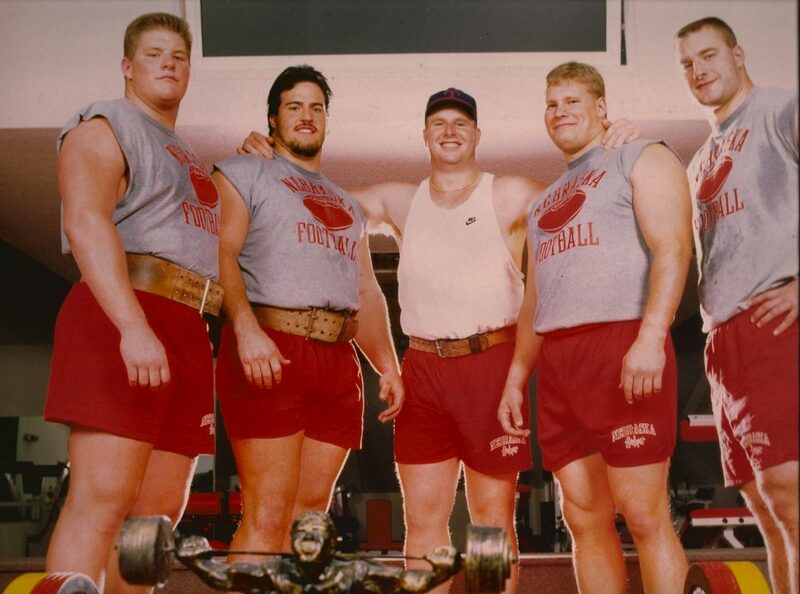 But the coaches, the trainers -I didn’t really know a whole lot of players- but the sense of family when I first got there to Nebraska was amazing. Not only that, but outside of that, the people instantly gave me a feeling of, ‘Hey, I’m in the right place.’ It was a huge turning point in my life. So here I was, 18 years old, I had direction and knew what I wanted to do -but had to make a commitment to actually going about it on my own, and not a lot of people do that- not a lot of people understand what goes into that; there’s a psychological rollercoaster ride when you do that. There’s a feeling of loneliness and wanting to go back to what you’re used to, and I remember thinking about when I made my decision and what I wanted to do: and I wanted to get away. I wanted to experience something completely different than my whole life previous to that, and Nebraska was definitely the road to take. And looking back on it now, it was the best decision I ever made. Q: Do you recall the first person on the team you befriended? And I turned around and look at this guy, and he said “How are you doing?” My first, initial thought was, ‘This guy… this guy is gigantic! I can’t believe how big he is!’ And for whatever reason I just blurted out, ‘Hey, are you Mike Petko?’ He says, “No, I’m Rob Zatechka. I’m a freshman like you. I’m playing in the All-Star game here at the stadium.” I was like, ‘What?! Are you kidding me? !’ I’m looking at this guy and he’s 285 lbs. –and I’m 240 lbs. soaking wet. Wet behind the ears coming in -and I look at Rob and he’s got a full-on beard, looks like he’s been in the program 4 to 5 years. So that was really my first memory, was meeting Rob. And then, of course, getting a chance to watch those guys play: Cory Schlesinger played in that game, Terry Conneally played in that game, some other guys…Zach Weigert played in that game. So there was a lot -Calvin Jones played in that game- so I got a good idea what to expect as far as becoming friends goes, and that was great. I just couldn’t believe Rob. I remember reading about him in Huskers Illustrated. They did a feature on me and also a feature on Rob. They did a feature about his academic as well as his athletic prowess, as well. Q: Did he know your name from the same Huskers Illustrated article? Q: So ’90 was your first fall. Did you redshirt, Brenden? BS: I did. It was a little bit of a different deal there. Ed Stewart, myself, Connealy, Rob, Zach, who else? Calvin Jones, I think that was it for that class. We all redshirted. Everybody else, except Cory, we played on that freshman team. Obviously, it created a great opportunity for guys to play at an early age, and you got to play the freshman squad of schools like BYU, Air Force, they came in and played us. And that was the last year, I think, Nebraska was the last one to participate in the freshman football program at a Division 1 level. 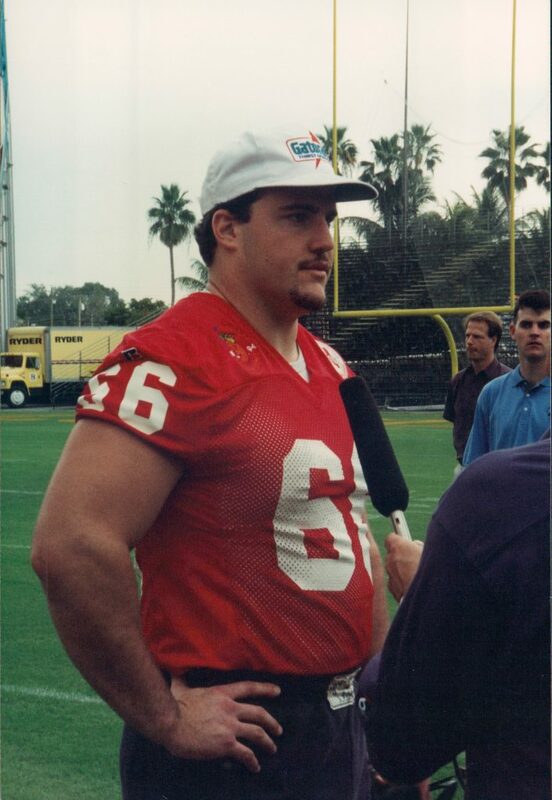 So for me and the guys, we didn’t have to play on that team, but still had to practice with them every now and then, and we were put into a position where we were above the 8 ball, because most of those guys playing on the freshman team would pretty much have to redshirt and start over the next year and really have 3 years of trying to compete and start for Nebraska. On one hand we really got great time playing the game right out of high school. And you crave for it. Now, I didn’t play really until my junior year… I didn’t start and play for Nebraska until my junior year. BS: It was. It was for me. I think it was my second year, I had a little bit of a chip on my shoulder when I came out of high school, I thought I was better than I really was. It took a lot of humbling that happened on my part, and I look back on that and I’m very grateful for a lot of people who intervened in my thought process. And there was a lot that had to do with it: I was missing home, I was missing my girlfriend, I was not getting the opportunity to prove myself day in and day out. It was sporadic here and there, struggling with that….overcoming the fact that I had one of the best linemen ever play at Nebraska and probably an NFL Hall of Famer -Will Shields- sitting right in front of me. So it was a long haul that I had to look at. And I’ll never forget Coach Kevin Steele. Somebody spread a rumor that I wasn’t happy with my situation and I wanted to transfer. And it was during one of our practices -now, we gave everything we had every day and that’s what really made us the team that we were in ’94 and carried it on to ’95– anyway, one day in practice we were going against the defense and beating the snot out of each other, and Zach Weigert and I are on the right side. Coach Kevin Steele comes up to me in the huddle, grabs me by the facemask right in front of everybody, and basically gives me the riot act, essentially gives me the “I love you. You’re wanted. We need you. You’re gonna be a great, huge part of what we have going on here. Don’t think about leaving,” you know? It was one of those things, just a shot of adrenaline, and it really made me take a look in the mirror and say, ‘What am I doing?’ And I sat back and I looked at what I was and set goals for myself. The whole time he’s looking at me like, “This guy is full of crap.” He looks at me and he says, “Well, those are great goals you have there. They’re a little lofty, but I like them.” And so I did everything I could to get to that level of obviously committing myself not only physically, but mentally in the classroom with my schoolwork, and every time I stepped out on the field it was not only about improving myself, but doing everything I could to improve my teammates in every level. Q: I remember booting you out of the weight room! Q: Then you guys would go sneak off to another gym, wouldn’t you? BS: Yeah. Now Paul, there were games, like Pacific? After the game we’d be in the weight room working out. Over at the Rec Center we’d work out. We’d work out at Goodyear, where I do now. BS: Oh yeah, anywhere and everywhere we could get our lift in, and that was kind of where we felt the most comfortable. If we didn’t get our work in we’d get this guilty conscience. And believe me, there were times -I wasn’t stupid when it came to working out- I tried many different workouts, and that was really where Boyd and I kind of butted heads. He had his philosophy and it worked and it was great, but there were some things he and I didn’t see eye to eye on, like defensive backs shouldn’t be doing the same weight training that offensive linemen should be doing. And over the years we had our discussions about it, and obviously how I felt that it kind of represented what I did out on the field. And everybody has their own way of doing things, and one thing I didn’t want to do was step on his toes too much, but it got to the point where he was ready to kick me out of the gym. And it got to the point where Coach Milt Tenopir found out about it and he said to Boyd, “Hey, listen Boyd, if Brenden’s out of there, we’re all out of there.” And it’s one of those things Boyd understood, that, ”Hey, listen, we’re all in this together, and we need to get along, and we have to make sure we’re not stepping on anybody’s toes here. And if it’s working for Brenden, let’s let him do it.” And I think Boyd kind of had the same feeling with Rob, who did his own thing, and Joel Wilks and Matt Shaw, and there were some other guys who just loved working out. We loved working hard, and I think a lot of what we did was to reset the culture as far as the work ethic and what it took to put your time in the weight room, out on the field, whether it was winter conditioning, summer conditioning, in practice when it came to the season, where you were giving everything 100%. And that’s what we did. Q: If I recall, did you and Rob put together a special 6-day routine? BS: Yeah, in the offseason we had some different things we did. What we found later on in our careers, really, in the NFL, was that there’s a lot of muscle memory that happens. And you being a strength coach -you know this- but it’s about trying to trick your body into thinking that you haven’t worked that same body part and making sure you shock it every time. Getting into that mindset that ‘every time I come in here I don’t just want to maintain; I want to get stronger.’ And over the years I figured out a way to do it, and for me it was working one muscle part as hard as I could once a week. Three days later I still had lactic acid in there and it still hurt me. In the NFL I would still do it. And like squatting, I still do it, and sometimes we’d know when we’d overdo it because we got too tight. And some guys in the NFL would eliminate squats altogether because we were getting too tight in the hips. But a lot of body movement weightlifting as far as lunges and side lunges and jumps and box jumps and all the other things that shock the system, that philosophy that Rob and I had, I think we probably went back and forth between 32 or 33 workouts, but the offseason was basically our experimental time. BS: I have to tell you the truth, Paul, when I first came into Nebraska I was -besides looking at Rob- when I looked around at the team, I wasn’t impressed. I didn’t see guys that impressed. And so there were a lot of things that came together for us, and fortunately we had a lot of success, because we didn’t have a lot of injuries. We had some obstacles to overcome; Tommie, my senior year, getting the blood clots and everything, that’s another story, but obviously every season every team has its ups and downs. But we didn’t have too many valleys. We had a few peaks. My junior year going into that Florida State game we had a really -I thought we had probably one of the best years at Nebraska that ’93 season at that bowl game- and then the next year we had to overcome a ton of adversity: we were down to our 4th string quarterback, go into a volatile environment there in Manhattan, Kansas and playing Chad May and the offense they had there…and we were really ripe for a beating, and we ended up overcoming. How did we do that? With our defense! Those guys stepped up, and we ran the ball something like 80 times up the middle. That’s all we could do, and there’s a lot of things that kind of played into that, being fortunate and not having a whole lot of injuries, but keeping those guys together and keeping that core, especially up front. Every game is won up front. It all comes down to that. And looking at those things we tried to instill… that whole environment in the weight room and out on the field? One day I said, ‘What was it that made those ’70’s teams great?’ And I was thinking about it and thinking about it and thinking about it. And one day I come in and say, I came into the weight room one day and I pulled my socks all the way up and I go, ‘Socks-up Tuesday! Socks-up Tuesday!’ Everybody said, “What’s that all about?” And I said, ‘That’s how they wore them in the ’70’s and that’s how they won the national championship.’ And I swear to you, Paul, everybody on the team was like, “That’s it!” And boom, the next year everybody was wearing their socks up. And then in college football, it was weird! In college football, everybody went from wearing the low socks to socks up. It was everywhere. It was great!